Vox Pop: Want HD video from iTunes and Apple TV? Since the new TV can handle video up to HD's 720p resolution, there's been a lot of speculation about whether the iTunes store will eventually start selling HD content, such as TV shows and movies. You can bet that the desire for that quality of presentation is theoretically out there (at least it is for this HD TV owner). The problem, as many folks have discussed at length, is that the file size for HD movies, in particular, may be prohibitively large for the garden-variety home broadband user. As Greg Keene notes, "With simple math, we can extrapolate that a 2-hour movie would be about 3.9 GB." That's not only a substantially lengthy download for, say, a residential DSL subscriber, it also represents the investment of over 10% of the available space on the Apple TV's drive (as well as, it should be noted, an equivalent chunk of space back on your Mac or PC's disk). Apple optimistically estimates that broadband iTunes users can download its “near DVD quality” movies in a couple hours, so HD movies would either take well over a day of sustained downloading at full tilt, or require far more compression. This is one reason I think the Apple TV may be giving a kind of temporary competitive advantage to producers of shorter-length HD content, such as -- well -- let's say video podcasters. It's a big reason behind our decision to start shooting and releasing The Merlin Show in 720p over the next month or so. The current hi-res version of the show -- which actually looks pretty good on my Apple TV -- is presented at widescreen 854x480, which makes our most recent, 14-minute episode weigh in at 88 MB (about 6 MB/minute). Seems to me that the typical expectation for podcasts is that, while they will be released on a relatively regular basis, they will also get downloaded automatically in the background and then get synched to a device like a Video iPod or TV for viewing at the user's convenience. But, movies, and to a lesser extent, single episodes of TV shows, strike me as more of an impulse item -- something you want to download and watch more or less now. Knowing there's two hours and multiple gigs of disk space between you and Norbit might be a disincentive to downloading, right? But, then again, people don't seem to mind the wait of their Netflix queue, right? I dunno. You tell me. Given the constraints of time and disk space, would you purchase (and wait for the download of) HD content for your TV? 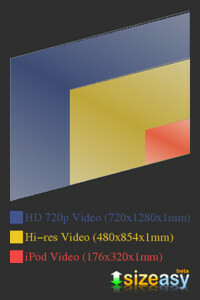 What do you think is an acceptable resolution for content on your HD TV? Anybody hacked on their unit yet? Whither TV, iTunes, and HD? Submitted by Ben (not verified) on March 25, 2007 - 1:23pm. I am perfectly happy listening to Mp3s on a single Mono speaker (it's a nice rich Tivoli speaker, but still). FM quality is fine, I don't need more. I feel the same way about video, every one's supposed to wan these amazing resolutions on huge screens, but iTunes TV shows on my 17 inch LCD are just fine with me. I think a lot of consumers just want to see good stories, and don't get focussed on the quality of the image once it's past a pretty low threshold.